Note: Oklahoma Watch is offering this detailed, 4,500-word story on events that led up to changes in the state’s most significant justice-reform effort in recent history. With Oklahoma having some of the nation’s highest incarceration rates, hopes soared in 2012 among leaders and residents when the Justice Reinvestment Initiative was signed into law. Others viewed it skeptically. Newly released records reveal what happened in state government that led to a weakening of the original plan for implementing the reforms. Behind-the-scenes moves by Gov. Mary Fallin’s senior staff members helped lead to a severe weakening of a program designed to cut the state’s high incarceration rates and save taxpayers more than $200 million over a decade, according to interviews and records obtained by Oklahoma Watch. The efforts by the governor’s staff, assisted by legislative leaders, to take control of the Justice Reinvestment Initiative took place during periods when staff members met with representatives of private prison companies, which stood to gain or lose depending on how the initiative was implemented, emails and logs of visitors to Fallin’s offices show. During that time, private-prison company representatives also made donations to Fallin’s 2014 campaign as well as to legislators, Oklahoma Ethics Commission records indicate. Steve Mullins, Fallin’s general counsel, said private prison groups and lobbyists played no role in the approach that he and other staff members took in regard to the initiative. “I know for a fact I’ve never recommended a private prison as a JRI solution, so I know that it wouldn’t have influenced anything because it didn’t influence my recommendations,” Mullins said. Mullins also pointed out that the Justice Reinvestment Initiative, or JRI, did not die. Several reforms, such as public-safety grants, received state funding and have been implemented. More from Oklahoma Watch’s investigation. But the JRI’s biggest supporters say the program was left in near shambles after the governor’s office delayed carrying it out, reversed itself on seeking a federal grant and orchestrated a move to keep former House Speaker Kris Steele, who led the initiative effort, from leading a group overseeing implementation. Steele said he believes a political desire to appear “tough on crime” and pressure from private prison groups ultimately curbed any serious reform efforts. Throughout the JRI process, Fallin has expressed support for the program and its goals. The goal of the JRI was to steer nonviolent offenders away from prison, lowering the state’s incarceration rates and costs and using the savings to pay for public-safety efforts, such as law-enforcement grants. But the planned funding dropped, sentencing alternatives aren’t being carried out, fewer pardon and parole officers to monitor offenders were added, and crime-reduction strategy training for local law enforcement agencies didn’t occur. The initiative also has no official coordinator. Renewed focus on the JRI comes after Fallin’s office released in late November more than 8,000 documents and emails related to the Justice Reinvestment Initiative. The records had been sought by various news media under the Open Records Act. The JRI also continues to draw attention because Oklahoma’s prisons remain overcrowded, with the population rising to more than 26,700 last week. • In January 2013, after failing to get Fallin’s preferred candidate named as head of the JRI oversight board, Rebecca Frazier, then Fallin’s assistant general counsel, emailed Mullins pointing out that if the state rejected a federal grant for the JRI, the coordinator job wouldn’t be funded. Mullins affirmed a “new tack” of rejecting federal funds. Previously, Fallin had supported obtaining the federal grant to fully implement the initiative. 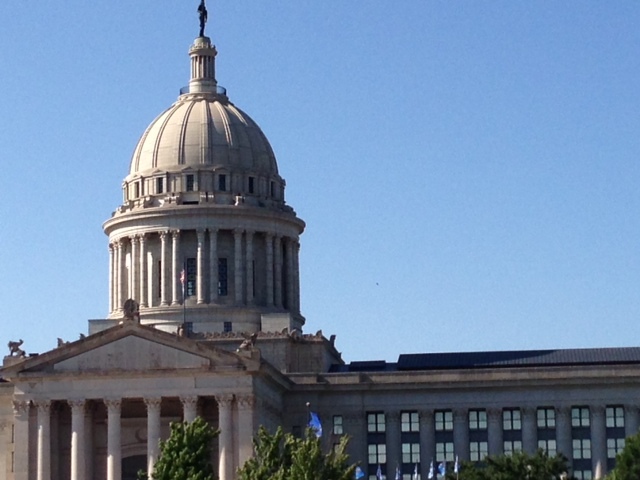 • Fallin’s staff played a key role in crafting and pushing legislation that would have done away with the JRI oversight group co-chaired by Steele and Oklahoma County District Attorney David Prater. Steele and Prater resigned from the JRI group in March expressing frustration at Fallin’s office. The legislation ultimately died, leaving no JRI oversight board or coordinator. • Facing a deadline for bills getting out of committee, Fallin’s’ Chief of Staff Denise Northrup urgently pressed for a vote on the legislation overhauling the oversight group. The email was sent within a few hours after Mullins met with the president and other representatives of private-prison company Geo Group. Mullins said the reform initiative was not discussed at the meeting. Northrup was unavailable for comment. • Early in the process of carrying out the initiative, Frazier stated in an email that as part of the program, the Department of Corrections planned to transfer prisoners to private prisons owned by Corrections Corporation of America and Geo Group. Justin Jones, former corrections department director, denies ever signing off on such a plan. • Five days after Steele’s and Prater’s resignations, the political action committee for Corrections Corporation of America made a $4,000 donation to Fallin’s 2014 campaign, putting the committee at the maximum donation amount. A few days later, a lobbyist who represents the company, among other clients, donated $5,000 to Fallin’s campaign. Geo Group had already made donations four days before the session started to 11 legislators, including $5,000 each to House Speaker T.W. Shannon and Senate Appropriations Committee Chair Clark Jolley. Nothing in the emails and other records reviewed by Oklahoma Watch states that actions taken by the governor’s staff or legislators were done at the request of private-prison companies. But the documents show private-prison companies communicated with the governor’s office specifically about the Justice Reinvestment Initiative. Messages left with Corrections Corporation of America and Geo Group officials were not returned. Steele said in an interview that the governor’s and attorney general’s offices were not seriously committed to the JRI reforms. Emails show Mullins and Chief of Staff Northrup wanted Steele off the JRI group once his term as Speaker of the House ended. He left the House because he was term-limited. Mullins said instead that in pushing the bill, Fallin’s office wanted to see the group overseeing implementation of the JRI reformed and codified into state law so that it had statutory authority and political muscle to implement change in the system. “It wasn’t the committee we needed to get the job done,” he said. On May 10, 2012, Fallin signed into law House Bill 3052, or the Justice Reinvestment Initiative. The signing was the culmination of a more than year-long effort in which Oklahoma sought assistance from the U.S. Department of Justice and the Pew Center on the States to implement a “justice reinvestment initiative.” As part of this, the Council of State Governments conducted a study of Oklahoma’s criminal justice system and returned in January 2012 with recommendations that led to the bill. The idea behind the law, authored by Steele and Senate President Pro Tem Brian Bingman, was to increase the use of sentencing alternatives and other reforms to steer nonviolent offenders away from prison, which would save on prison costs, then reinvest the savings in public-safety efforts. The law required post-release supervision of felons, recommended diversion programs for non-violent and drug offenders and established a grant program for local law-enforcement agencies. The concept had been successfully implemented in other states, including Texas. A core JRI oversight group composed of state agency officials and others were to take the next steps, including working with the Council of State Governments to apply for grants, implementing the reforms and monitoring progress. Steele and Prater co-chaired the group. About $400,000 in federal grants was to pass through state agencies to be used to hire a coordinator and to train workers, such as parole officers and substance-abuse counselors, to carry out the plan. Steele said Attorney General Scott Pruitt’s and Fallin’s offices began to “slow-play” cooperation by refusing to communicate with the Council of State Governments or the JRI oversight group for long periods of time. Deadlines were missed, he said, so that eventually the council asked the JRI group if the state still wanted grants to fund the initiative. Pruitt’s office was unavailable for comment. In response, Fallin sent a letter to the Council of State Governments in October 2012 saying that the state was still supportive of the JRI. “It was a way, I think, to appear supportive,” Steele said. Meanwhile, the governor’s office was having doubts about the JRI oversight group, according to Mullins. Initially, Fallin’s office did not have a seat on the JRI group, Mullins said, and the group lacked influential legislative players who could help get reform policies enacted. “Clearly, we thought that the committee was not well-designed to be an execution committee. It was designed to be an evaluation committee,” Mullins said. Other issues arose. Frazier, deputy general counsel, wrote in an email that Mullins felt the Council of State Governments was trying to control the process too much. Also, when the JRI group prepared to meet for the first time in September 2012, Prater and Steele agreed the meetings would be subject to the Open Meeting Act. That did not go over well with Mullins, Steele said. Mullins asked the group to hold private “pre-meetings” with the governor’s office to outline what would be discussed at the open meetings. Mullins denied he was opposed to opening the JRI group’s meetings. The JRI group agreed to the pre-meetings. Even so, Fallin’s office told two key agency heads – Department of Corrections Director Justin Jones and Department of Mental Health and Substance Abuse Services Director Terri White – not to attend any of the meetings, Steele and Mullins said. Instead, Frazier was sent on their behalf and was to report back to them. However, Steele said this became an issue among group members when Frazier could not answer questions about the progress of JRI reforms within the different agencies. Steele had hoped to select a coordinator by Dec. 12, according to the emails. He asked Fallin’s staff to decide whether the coordinator would be housed in the governor’s office. On Jan. 9, 2013, the JRI group voted, 5-1, to name as coordinator Sarah Brune Edwards, an attorney with the law firm Crowe & Dunlevy who had worked on pardon and parole issues under Gov. Brad Henry. Frazier was the only dissenting vote. Steele said the governor’s office had favored a former district attorney, Craig Corgan, who recently told Oklahoma Watch that he had been referred for the position by Mullins. Mullins explained that the governor’s office wanted a coordinator who could manage both the initiative’s political issues and the grant money. “We thought she (Edwards) was fine, but we thought there were better candidates,” he said. Two days after Fallin’s choice was rejected, Frazier emailed Mullins pointing out that in order for the coordinator position to be funded by the federal grant, the money would have to pass through a state agency. “If all of the agencies refuse funds, there will be no way to pass through the coordinator funding,” Frazier wrote. Mullins said in an interview that after Fallin had provided her letter of support for federal JRI grant money, most state agencies and groups due to receive the money decided they didn’t need the funding after all. “If they didn’t need the money, then we didn’t need the coordinator for all the money,” Mullins said. Previously, directors of two agencies that would play key roles in the JRI – Jones, of the corrections department, and White, of the mental health department – had expressed support for the reform initiative. They also have repeatedly called for more funding of their agencies. A month would pass before Steele and Prater learned of the governor’s rejection of federal funds. Before the justice initiative was signed into law in May 2012, private prison groups expressed interest in the program, emails show. On April 4, 2012, Geo Group lobbyist Brett “Cooper” Robinson sent an email to Frazier and Fallin’s policy director Katie Altshuler, asking them to sit in on a meeting between Geo Group representatives and Northrup. Representing Geo Group at the meeting were John Hurley, president; Reed Smith, senior vice-president; Claude Chester, warden at the company’s Lawton facility, and Tonya Lee, a lobbyist representing the firm, according to the email. Geo Group operates the Lawton Correctional Facility and is contracted to operate an empty private prison in Hinton. Mullins said any talk about the justice initiative during that meeting would have been forwarded to the Department of Corrections. “The only discussion with Geo would have been: they would have come in and pitched that they could have done something for us cheaper. And we would have taken that pitch and given it to the Department of Corrections,” Mullins said. Avalon Correctional Services, which operates halfway houses on contract with the state, also expressed interest in the JRI as a way to expand its business. The company began writing letters to Department of Corrections officials in 2011, asking the state to set up an “intermediate sanction facility” at one of its halfway houses. Intermediate facilities are used for short-term stays for inmates who violate probation or parole conditions and are considered alternatives to prison incarceration. The expanded use of such facilities was among the recommendations issued in early 2012 for including in the JRI. On April 5, 2012, Avalon President Brian Costello sent Corrections Director Jones a letter about the potential need for intermediate sanction or revocation bed space under the JRI. The letter proposed that the department modify its contract with the company or draft a new contract with Avalon to provide intermediate facility space. On May 10, the day the JRI was signed into law, Jones replied, declining the offer. Avalon officials did not return calls seeking comment. By July, staff members for Fallin also were discussing intermediate facilities. In a July 30 email, Frazier stated that as part of the justice initiative, the Department of Corrections would be moving offenders out of state-run facilities and into Geo Group and Corrections Corporation of America prisons and then use the freed-up space to create intermediate revocation facilities. Mullins told Oklahoma Watch that the plan to shift prisoners to private prisons under the initiative was proposed by Jones. Jones said in an interview that he did not present a formal plan to move state prisoners to private prisons to make room for intermediate facilities and was never advised by the governor’s office about the plan. Jones has been an outspoken opponent of sending state prisoners to private facilities, although during his tenure inmates have been moved into private prisons. On March 5, 2013, Avalon representatives met with Northrup and Frazier at the governor’s office. Costello, the Avalon president, wrote later in an email that the discussion included the correction department’s budget as it related to the JRI recommendation for revocation facilities and beds. The email closes with Costello stating the corrections department was not in compliance with a law requiring nonviolent offenders to be placed in a step-down facility for a specified period prior to release. Mullins said any requests or recommendations from Avalon during the meeting would have been forwarded to the Department of Corrections for consideration. “We don’t have meetings on that,” Mullins said. “We have letters that we will send on, but all of the meetings I’ve had with private prisons have been on per-diem rates.” Per-diem refers to the amount the state pays private prisons per day for each inmate. Jones denied to Oklahoma Watch that the department was out of compliance with the law, saying audits had confirmed compliance. Jones said he was never briefed on the meeting between the governor’s office and Avalon, although Sen. Clark Jolley visited with him more than once about Avalon’s role. Jones did confirm the private-prison companies’ continued interest in per-diem rates. He said that in 2011, then-Secretary of State Coffee, appointed by Fallin, called him near the end of the legislative session and asked him to call House leaders and request approval of a Senate-passed bill giving per-diem increases to private prisons. The per-diem increase was not part of the negotiated budget and would be unfunded unless the House acted, Jones said. “He advised me the governor supported it and it was in my best interest to make the call, which I did,” Jones said. In the days leading up to the JRI group’s vote on a coordinator, House Speaker T.W. Shannon filed House Bill 2042, which would be used to try altering oversight of the JRI. The bill filed by Shannon was a “shell bill,” meaning it had no legislative text but served as a placeholder in which a lawmaker can later insert language. On Feb. 4, the first day of the session, HB 2042 got its first reading and was referred to the House public safety committee. Rep. Jason Murphey began drafting text for the bill and became its author. He told Oklahoma Watch that Shannon’s staff brought the JRI group to his attention and said changes needed to be made. Shannon’s office did not return calls from Oklahoma Watch seeking comment. Murphey said because the JRI group was not codified in state law, and thus not subject to state regulations such as the Open Meeting Act, it was important to make sure the group had statutory authority. “I think the feeling was that if the initiative were to be a success, it would have to be through a legally formed entity, but if it was an ad hoc group, it couldn’t be successful,” Murphey said. He added that the bill did not seem like a major item to the governor’s office or any special interests. On Feb. 14, Frazier sent an email to several Fallin staffers saying Murphey was thinking about a bill to codify the JRI board by assigning its oversight duties to an existing state board. Shannon’s office wanted the governor’s office’s thoughts on it as soon as possible, Frazier said. Frazier replied that Shannon’s office was hesitant to take Steele off the JRI group. Mullins suggested using the bill to limit a newly proposed JRI board to two years, and allow the governor’s office to appoint the chair of the board. Four days later, Murphey sent proposed language for the bill to House staff, Shannon’s special projects director and Altshuler, policy director for the governor. The language codified the JRI board and gave the governor the power to appoint the board’s chair, and for the House Speaker and Senate President Pro Tem to appoint other members. Meanwhile, Mullins, Frazier and Northrup were discussing the federal grant that would have paid for the JRI coordinator position. On Feb. 21, Frazier sent an email to the liaison and the JRI oversight group saying the state was turning down the funds. Steele responded to Frazier, saying he was “stunned” by the decision, which circumvented the JRI oversight group, especially given Frazier’s previous willingness to abide by the group’s decisions. “It is difficult to believe the Gov remains highly committed to justice reinvestment when she unilaterally denies the funding and expertise needed to successfully implement the policy,” Steele wrote. The death knell for the JRI group came on March 13, 2013, one day before the group’s scheduled meeting and the deadline day for bills to be out of committee. According to Fallin’s visitor sign in sheet, at 9:25 a.m. that day, Geo Group company President John Hurley, Senior Vice President Reed Smith and Geo Group lobbyist Tonya Lee met with Mullins in the governor’s office. At 11:56 a.m., Northrup emailed Fallin’s legislative director Craig Perry with the subject line of “urgent” asking if she could get information on whether House Bill 2042 had made it out of committee. “Let me know, but I think this is worth asking a favor on before tomorrows (sic) JRI meeting…” Northrup wrote to Altshuler later that afternoon. The bill made it out of committee and passed the House that night. Fallin’s office issued a press release thanking the House and reaffirming her commitment to JRI. The next morning, Steele and Prater resigned from the JRI group, saying the governor’s office had not taken the initiative seriously and had been dishonest. The JRI oversight group disbanded. Mullins said the goal was not to get Steele and Prater to resign. “He and David Prater are both very passionate people. They had a view on how it should be done. We are passionate people and we have a view on how it should be done,” Mullins said. HB 2042 was amended slightly and passed by the Senate but was never heard in conference committee. Mullins said the governor’s staff stopped pushing the bill because they didn’t think it had enough support. Murphey said the bill had become politically toxic. Five days after the resignations, on March 19, Corrections Corporation of America’s political action committee provided a $4,000 donation to Fallin’s 2014 campaign. Ten days afterward, Fallin’s campaign accepted a $5,000 donation from Corrections Corporation lobbyist Tammie Kilpatrick. Mullins denied that the meetings with private prison officials and the campaign donations played a role in the decisions and actions surrounding the JRI. “They (campaign donations) have absolutely no influence. None at all,” he said. Mullins said private prisons were not considered part of the JRI program, and he never recommended that they be included. “There’s no direct end correlation to JRI,” he said. Mullins said while he met annually with representatives from all private prison companies in the state, the meetings boiled down to basically the same thing: the companies inquiring about per-diem rates and pitching their product. The March 13 Geo Group meeting with Mullins and Northrup’s urgent messages were unrelated, Mullins said; that meeting did not involve JRI. Mullins said Fallin’s position on incarceration facilities does not favor private prisons over state-run facilities, only the quality of the services provided. “If private prisons can be cost-effective, if they can be more efficient, and if they can be accountable, then we’re for private prisons,” he said. Despite the conflicts, Mullins said many of the JRI’s reforms have been implemented and Fallin’s commitment to JRI remains strong. The state mental health department has developed an evaluation tool for judges for alternative sentencing, law enforcement grants are being provided, and the corrections department has set up intermediate beds for probation or parole offenders. Weintz, Fallin’s spokesman, also said the governor is still strongly committed to the initiative. But Steele said many of the reforms have not been implemented because they were not adequately funded. Legislative leaders initially agreed in May to spend $3.5 million, but that amount was reduced. The Council of State Governments had recommended spending $6 million in fiscal 2013 and $13 million annually beginning in 2014, for a total of $110 million by 2021. Oklahoma Watch’s Lindsay Whelchel contributed to this story.